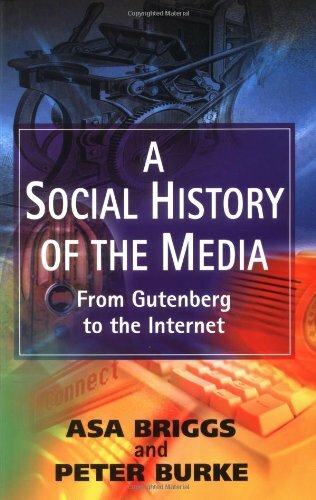 Amazon.com description: Product Description: Written by two leading social and cultural historians, A Social History of the Media provides a masterful overview of communication media and of the social and cultural contexts within which they emerged and evolved over time. The authors retrace the complex and multiple paths of development, exploring the interrelations between communication media and other aspects of social life. The scope of this book is far-reaching, exploring the history of the different means of communication in the West from the invention of printing to the Internet. It deals with each constituent element in what came to be called 'the media' and discusses, among other things, the continuing importance of oral and manuscript communication, the rise of print, the relationship between physical transportation and social communication, and the development of electronic media. The book concludes with an account of the convergences associated with digital communication technology, the rise of the internet and the phenomenon of globalization. Avoiding technological determinism and rejecting assumptions of straightforward evolutionary progress, this book brings out the rich and varied histories of communication media. It will be an ideal text for students in history, media and cultural studies and journalism, but it will also appeal to a wide general readership.